Jeppesen recently agreed to a five-year electronic flight bag (EFB), tailored digital charting and navigation service renewal contract with Jet Airways, a leading commercial carrier based in India. The agreement provides Jeppesen solutions for Jet Airways and its subsidiary carriers Jetlite and Jetkonnect. The agreement includes Jeppesen FliteDeck Pro class 2 EFB services with an enroute situational awareness application, tailored digital charting services and NavData navigational information. Jeppesen’s leading tailored airway manual charts for digital navigation are provided for Jet Airways in the agreement, through Web-based e-Link tailored charting services, presented in a Windows operating environment. Jet Airways operates a fleet of approximately 95 commercial aircraft, featuring Boeing 737 and 777 models. Jet Airways operates flights to 24 international destinations and 47 domestic routes in India. 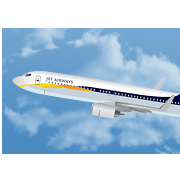 For more information on Jet Airways and its subsidiary carriers, please visit www.jetairways.com. For more information on the industry-leading commercial aviation navigation solutions provided by Jeppesen, please visit our navigation information solutions site.